The company said the change is "as a result of favorable mining conditions and lower than expected costs." Energy Fuels expects to mine approximately 250,000 lbs. of additional U3O8 from the Pinenut Mine from mid-2014 to 2015 which will be stockpiled at the mine. The mine began production in 2013. The company's press release says "Northern Arizona’s 'breccia pipes' contain the highest-grade uranium deposits in the U.S., and among the highest grade uranium deposits in the World, outside of Canada. As a result, these projects are among the lowest cost sources of uranium production in Energy Fuels’ portfolio." 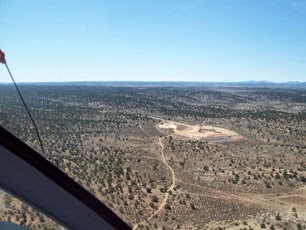 The company's describes the Pinenut Mine as "a fully-developed uranium mine located in northern Arizona approximately 35 miles south of the town of Fredonia, Arizona. Energy Fuels is producing at the Pinenut Mine, with the ore being processed at Energy Fuels’ White Mesa Mill. The mine site for this high-grade “breccia pipe” deposit has less than 20 acres of total surface disturbance and is situated on land managed by the U.S. Bureau of Land Management. The mine was partially developed in the late 1980’s and a shaft was sunk to a depth of 1,350 feet. At that time, this high-grade "breccia pipe" deposit was mined and produced 526,000 lbs. of U3O8. As of September 30, 2012, there are approximately 1,037,000 lbs. of U3O8 remaining at Pinenut contained in 95,000 tons of inferred resource at an average grade of 0.54% U3O8." The company website says "Energy Fuels is currently America’s largest conventional uranium producer, which supplied approximately 25% of the uranium produced in the United States in 2013..."